The Magellan RoadMate 9400-LM high-sensitivity GPS system features a 7" touch screen to provide an instant access to navigation. The GPS has exclusive QuickSpell® technology with SmartCity Search. This excellent device features the exclusive and highly acclaimed OneTouch™ favorites menu. 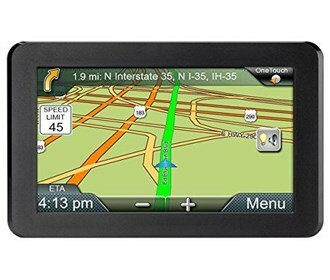 The RoadMate 9400-LM gives you confidence while on the road with premium features including junction view, landmark guidance, speed limit warnings pre-loaded maps of United States, Canada, and Puerto Rico. The best parking feature helps you find parking garage locations, hours of operation and directions to the entrance. The built-in map shows your location, destination and route in 3D for a clear birds-eye view of your surroundings. The Magellan Roadmate 9400-LM - Replaced by Roadmate 9612T-LM has many exciting features for users of all types. It's one of FactoryOutletStore's best selling . You can extend the lifetime of your Magellan Roadmate 9400-LM - Replaced by Roadmate 9612T-LM with the purchase of a FactoryOutletStore Factory Protection Plan. See the Magellan Roadmate 9400-LM - Replaced by Roadmate 9612T-LM gallery images above for more product views. FactoryOutletStore stocks a full line of accessories like 7" GPS Case, Car Charger, and Dashboard Disk Mount for the Magellan Roadmate 9400-LM - Replaced by Roadmate 9612T-LM. The Magellan Roadmate 9400-LM - Replaced by Roadmate 9612T-LM is sold as a Brand New Unopened Item. I bought a Magellan GPS model 9412T-LM and one week later we tried to go somewhere and when we went to program it, it froze up. Now the logical thing to do was to exchange it but Nobody wants to do that because we lost our receipt and without a receipt they won't exchange it. Funny because Wal-mart usually gives you a card for in store returns like this one but noooo they won't touch it now.